Instructions: Click here to view a larger phot of this project. Take the chipboard tag and cover in gesso. Let dry. Splatter the teal and purple mists, by flicking. Let dry. Add dots of the glitter ink, then using a straw blow at each drop to create a spreading splatter. I used a stickable stencil and texture paste to add texture up the middle of the tag. Let dry. Splatter white paint over the entire tag. Let dry. Sand the edges of the tag. Drag the edges of the tag in the glitter ink. Stamp 1 of the large Lush Lilac, and 1 set of the flowers using brown ink onto white cardstock. Add color to both pieces using ink and daubers. For the large lilac image I used Hyacinth, Pixie and Eggplant, then added green to the leaves using Seaweed. Add color to all of the small flowers using Pixie, the lightest shade of purple. 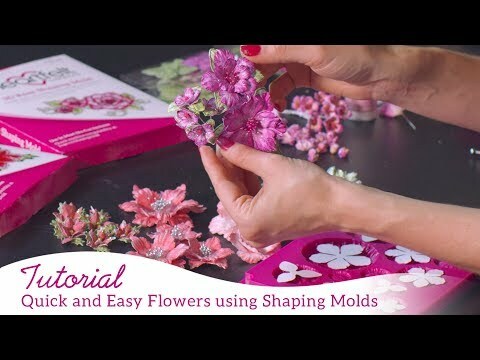 Use the Lush Lilac Shaping Mold to shape all of the flowers, and the stylus to shape the large lilac image. Splatter the leaves with dimensional spray. Let dry. 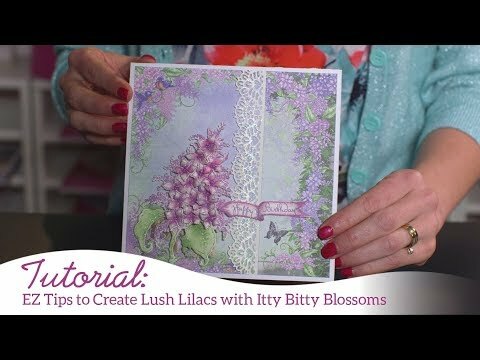 Add the mini flowers to the large lilac image. Using liquid adhesive, add the purple Prills to the middle of each flower. Wrap white/silver bakers twine around the base of the tag. Adhere the lilac onto the tag. 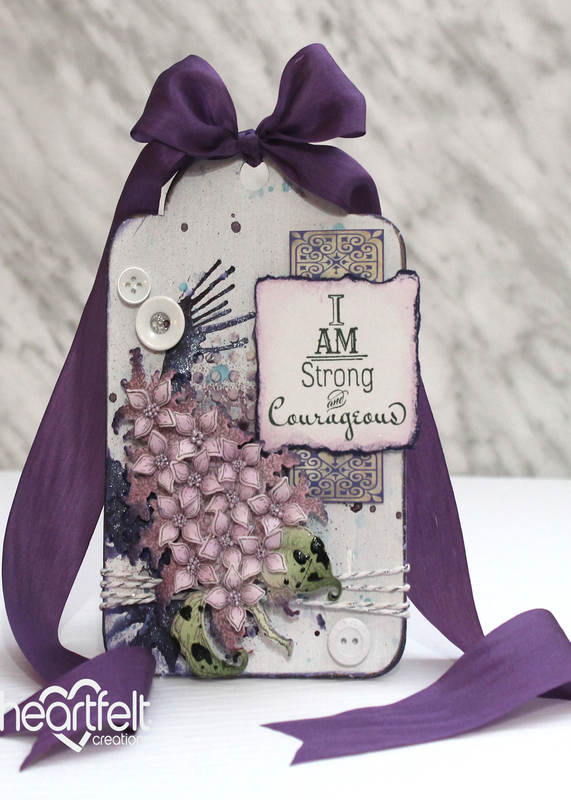 Stamp the "I am strong and courageous" sentiment onto white cardstock using dark green ink (Ponderosa Pine). Tear around the sentiment, ink the edges using Hyacinth ink and then drag the edges in the glitter ink. Find and cut out the small journal tag and cut it in half. Adhere to the top right corner of the tag separated slightly in the middle. Adhere the sentiment on top. Add buttons around the tag. Add the purple silk ribbon bow to the top of the tag.